Summary: Penelope is an over-scheduled child. Her mother, energetic, ambitious and organized, sees that no time is wasted in Penelope’s day, backing up her plans with quotations from Poor Richard’s Almanac. There is no time for day-dreaming, writing, or visiting with her neighbor Miss Maddie since, as Penelope’s mother says, “Time isn’t free.” Penelope realizes that her mother’s determined plans for her life are drying up all her good ideas. Then one day her calendar is miraculously blank and she falls through the space into the Realm of Possibility where she makes a new friend, Dill and learns about the Great Moodler who could moodle on the smallest notion and come up with real possibilities. Moodling-day dreaming, letting your mind wander, losing track of time, doing nothing-sounds exactly like what Penelope needs to unlock her writer’s block. Unfortuntately, the Great Moodler has disappeared, banished by Chronos. Since Chronos arrived time now is scarce and people depend on Chronos and his Clockworkers to manage time in the Realm of Possibility. Doing nothing is a crime that results in imprisonment in the Clock Tower. 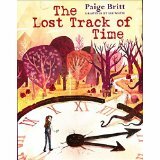 Before Penelope gets back home she must defeat Chronos and his Clockworkers, save Dill from being pressed for time, and return the Great Moodler to the realm where anything is possible and nothing is impossible. Then she must face her own problem at home: making time for herself. Literary elements at work in the story: Fantasy, adventure, and a love affair with words. Penelope collects words, moodle being the favorite, and Dill multiplies synonyms. Time and Possibility are used in every possible way. Not since The Phantom Tollbooth have I read a book that has had as much fun with language. Britt’s imagination enlivens every page from the mushroom soufflé Dill creates to the Fancies that furnish flight and the clock tower with its complex works. All of the excellent illustrations are done in shades of purple with the visual imagination a good match for the verbal. If the book has a weakness it’s that Penelope’s mother makes other Tiger Moms look like pikers. As a “real” person rather than a “fantasy” person (like Chronos) she should be believable and she’s not. How does the perspective on gender/race/culture/economics/ability make a difference to the story? Not applicable. Theological Conversation Partners: Penelope’s Mother and the Bible share an understanding of the importance of time. “So teach us to number our days,” prays Psalm 90 as the writer thinks about the brevity of human life in contrast with God’s eternity. Life is limited. (Ps 103:15,16) Where they differ is in understanding how time is to be used and what constitutes wasted time. Marva Dawn has called worship “a royal waste of time.” And not only did God rest but God’s people are commanded to rest one day each week, (Ex 20:8), not only the longest command but also on par with refraining from murder, adultery, and theft. But while Christians have time to “waste,” there are also deadlines-the Day of the Lord; the Master returns and time is up. (Mark 13:32-37)-Make the most of the time says Paul (Eph. 5:16) implying that every second is important in the Kingdom of God. There is no suggestion in this story that time is the gift of God; it’s a moral tale about ambition smothering creativity, imagination, relationships. Read it for pleasure. Still, there are opportunities in discussing the book as a Christian to think about time as a gift from God. How is it to be used? How do we waste it? How can we be thankful stewards of time rather than overscheduled controllers? Acknowledging that youth have many requirements on their time, help them to see their choices. We use many words to describe time. Think up as many verbs as you can that you use with time: make, lose, waste, etc. Now think of adjectives: spare, free, etc. We talk about time a lot. Penelope says to Miss Maddie, “I’ve only got a minute.” Miss Maddie says, “You’ve got all the time in the world.” Who is right? What does Penelope’s mother think about time? How is it to be used or filled? What’s good about her idea of time? What’s wrong? Penelope defeats the Wild Bore by getting words in edgewise. How does this experience help Penelope? What ten words would you use to defeat the Wild Bore? “Now” is the word that breaks Chronos’s spell and allows Penelope and Dill to escape. Why does this destroy his control of time? The Great Moodler says, “Time isn’t precious, Penelope. You are. As long as you remember that you’ll use time wisely.” Why would valuing yourself make you use time well? What is moodling? Is it a waste of time? Make a schedule of a day in your life. This day is a gift from God. How many things do you HAVE to do? What time do you have that is not scheduled? How does God want you to use your time? Would moodling be part of it? What’s wrong when you feel that there isn’t enough time? This review is written by alumna Virginia Thomas and co-author of Children’s Literature for All God’s Children. The Lost Track of Time by Storypath is licensed under a Creative Commons Attribution-NonCommercial 4.0 International License.